CRU: Is Getting Cancer All About Bad Luck? No. Is Getting Cancer All About Bad Luck? No. Headlines were ablaze again last week with a study suggesting that two-thirds of cancer cases are primarily due to “bad luck.” If this sounds familiar it’s because this is a follow-up to research published two years ago with similar findings. As in the last paper -- which we wrote about here – experts note that this study may lead people to incorrectly underestimate the clear research on behavior and cancer prevention. AICR research and other health organizations show that lifestyle steps such as staying a healthy weight, not smoking and exercising can prevent hundreds of thousands of US cancer cases a year. "Unfortunately these 'bad luck' headlines add to confusion about lifestyle and cancer risk, says Alice Bender, MS, RDN, Head of Nutrition Programs at AICR. "There's strong evidence that how much we weigh and move, and what we eat have a powerful impact on cancer risk." In this paper, published in Science, the authors calculated the number of lifetime stem cell divisions of a given tissue. These mutations occur in healthy cells as they divide, which led the authors to term these mutation “bad luck.” The researchers then matched those data against cancer rates in the various tissue types. Two years ago, the authors focused on US cancer rates and data. This time, they investigated 17 cancers across 69 countries. Different cancer types in the various countries had slightly different conclusions. In the UK population, for example, when looking at 32 cancers, the authors concluded that two-thirds were due to random cell mistakes that occur in replication, another 29% was due to environmental factors and 5% due to hereditary genes. The authors note that these are estimates and that mutations alone do not guarantee a cancer will develop. “A cancer in which 50% of the mutations are due to these random mutations can still be preventable,” they write. It generally requires more than one mutation to develop the disease and a cancer that requires two mutations is still preventable if one was due to a random mutation and the other due to an avoidable environmental factor. Cancers are due to genetic mutations yet similar to the last paper; this one also drew criticism for its methods. By placing such concrete numbers on what leads to cancer makes a faulty assumption, says Edward L. Giovannucci, MD, ScD, of the Harvard School of Public Health and one of the panelists on AICR/WCRF’s Continuous Update Project. "Although considered random mutations, these are the result of an external modifiable process," he said. Excess body fat leads to chronic inflammation, for example, and inflammation can leads to DNA damage and other hormonal effects that can promote cancer development. Notes Fred Hutchinson cancer prevention expert Anne McTiernan, MD, PhD: “The authors are assuming that just because tissues which have high stem cell turnover also have high cancer rates, that one is causing the other. They’re ignoring the possibility that the tissues with high stem cell turnover might be more susceptible to environmental carcinogens." Experts also note that it’s difficult to measure environmental exposures, so our estimates of preventability are likely very underestimated. Finally, they’re not considering the role of environmental factors in promoting a cancer’s growth or in preventing regulation of mutated cells. As the authors point out, primary prevention is the best way to reduce cancer deaths. 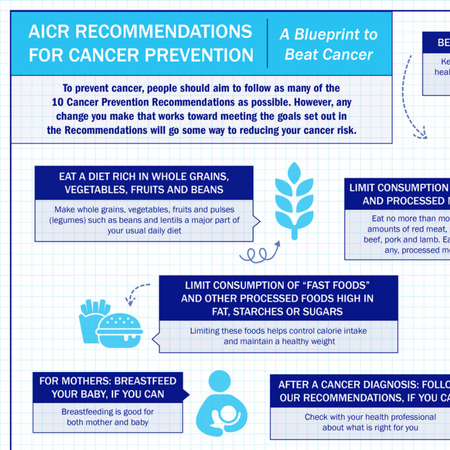 Following these evidence-based recommendations for cancer prevention links to reduced risk of the most common US cancers. And while not all cancers can be prevented, there are many steps individuals can take to reduce the risk of the most common cancers. "Those at high–risk for cancer, such as women who carry the BRCA gene or have a strong family history, may want to include extra screening or other measures," says McTiernan, and should talk with your doctor. "There are no guarantees when it comes to cancer, but there is clear evidence that individuals can take steps to lower risk,” says Bender. “You can start by making small evidence-based healthy changes like adding more steps everyday, swapping out sugary drinks for water or unsweetened tea, and subbing vegetables for foods with added fat, like fries." The Science paper work was supported by grants from the John Templeton Foundation, the Virginia and D. K. Ludwig Fund for Cancer Research, the Lustgarten Foundation for Pancreatic Cancer Research, The Sol Goldman Center for Pancreatic Cancer Research, and NIH grants. Source: Tomasetti C, Li L Vogelstein. Stem cell divisions, somatic mutations, cancer etiology, and cancer prevention. Science. 2017 Mar 24;355(6331):1330-1334.